Palm Cafe - Open daily for breakfast, lunch, and dinner. Take-out options available. Pool Bar & Grill - Offers cocktails, dishes served poolside from the Palm Café, and live guitar music on weekends. Marketplace - Small convenience store selling groceries, snacks, sundries, and gifts. 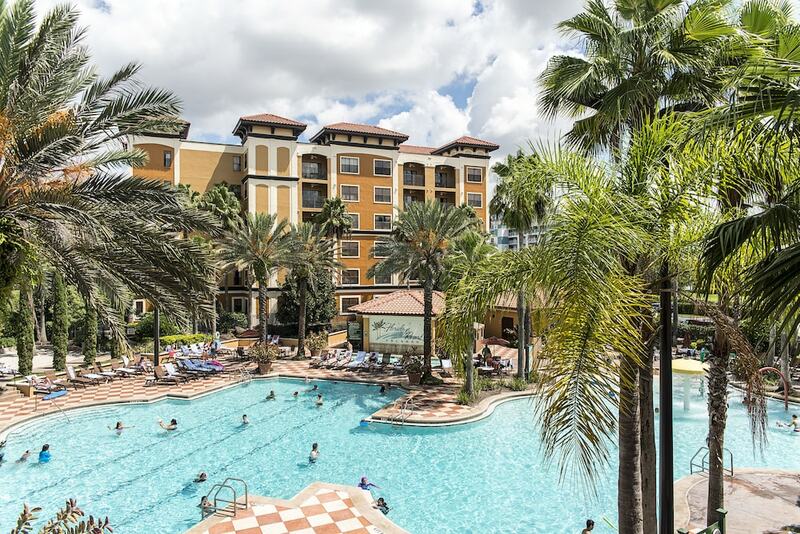 At this Orlando resort, the main outdoor pool is surrounded by lush palm trees and features a fountain, water-jet playscape, and wading area for small children. This area also contains an expansive patio for lounging and a sand-filled beach for sun and fun. A second pool complex, which is more secluded and offers additional sunbathing areas, is popular with lap swimmers. An on-site fitness center is equipped with treadmills, elliptical trainers, strength-training machines, and two plasma-screen TVs. The welcome center includes a game room. Orlando is a haven for golfers, and there are numerous public golf courses close by. Nearby courses include Shingle Creek Golf Club and Grande Pines Golf Club. Grande Pines offers a kids-golf-for-free program for children under 15. Fees vary according to season and time of day.